Analysis: After the Texans extended a second-round tender to Fairbairn in early March, a return to Houston was all but guaranteed considering the price tag attached to him. In his second pro season in 2018, he led the NFL in both field-goal attempts (42) and field goals made (37) en route to 150 points. This latter number likely will go down if the Texans find the end zone more often this fall, but he should still be among the top kicking options for fantasy purposes. Analysis: The Texans won't take any chances with their starting kicker, who converted every kick he attempted inside 40 yards last season and was the NFL's scoring leader. Houston would receive a second-round pick in the unlikely event that Fairbairn receives an offer sheet the team doesn't want to match. Fairbairn appears on track to be a top fantasy option at the kicker position in 2019. Analysis: Fairbairn finished off the regular season tops among kickers with 150 points, three field goals clear of Baltimore's Justin Tucker. He was first in field-goal attempts (42) and makes (37) as well, taking advantage of the Texans' inability to finish drives. He was a difference maker some weeks, posting double-digit points seven times, including individual games of 17, 17 and 16 points. Analysis: Fairbairn had been successful on 24 consecutive kicks before a second-quarter extra-point attempt sailed wide right. Despite the miss, he managed a credible six points and maintained his NFL scoring lead with 142 points after 15 games. Analysis: This was the second time in three games that Fairbairn has successfully converted five field goals, and the fourth time Houston's offense has presented him with that many attempts in a game. He leads the NFL with 136 points and 34 field goals, partially due to the Texans' inability to finish drives. Houston ranks 26th in the NFL, scoring touchdowns on just 50 percent of its red-zone opportunities. Fairbairn made all three of his extra-point kicks and did not attempt a field goal in Sunday's 24-21 loss to the Colts. Analysis: The three points were a season low for Fairbairn, who had shot to become second among the NFL's scoring leaders after posting 38 points over the previous three games. He wasn't given much of a chance Sunday, as six of Houston's 11 possessions ended in four plays or fewer. Fairbairn successfully converted a career-high five field goals in Sunday's 29-13 win over the Browns. Analysis: Houston's 25th-ranked red zone offense once again presented Fairbairn with a number of scoring opportunities, and the third-year kicker from UCLA happily obliged. He made kicks from 35, 42, 48, 53 and 38 yards while also converting two extra-point kicks for a career-high 17 points. He leads all kickers in scoring (116 points) and ranks second overall to only the Rams' Todd Gurley (120) on the season. Fairbairn made both of his field-goal attempts and all four extra-point kicks for 10 points in Monday's 34-17 win over Tennessee. Analysis: Fairbairn has 21 points over the last two weeks, a surge that has moved him to third among kickers in scoring with 99 points (9.0 PPG). He also leads the NFL in field-goal attempts with 29. Fairbairn converted three of his five field-goal attempts and both of his extra-point kicks for 11 points in Sunday's 23-21 victory over Washington. Analysis: Fairbairn experienced the highs and lows of placekicking in the Week 11 win. 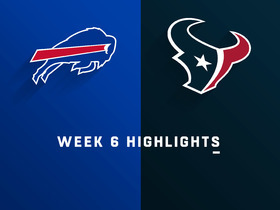 His 54-yard field goal midway through the fourth quarter turned out to be the game-deciding score, but he misfired on a 45-yarder later in the game which would have made life easier for the Texans. He also missed a 44-yarder earlier in the contest. Still, he's been a productive kicker in 2018, leading the NFL with 27 FGA while successfully converting 81.5 percent of his kicks. Fairbairn successfully converted both field-goal attempts and one of two extra-point kicks in Sunday's 19-17 win over Denver. Analysis: Fairbairn's missed extra point, his first of the season, loomed large entering the fourth quarter of a one-point game, but the Texans gave the kicker a chance at redemption. 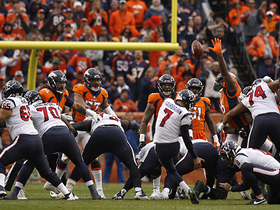 He connected from 37 yards away for the final scoring play of the game, clinching Houston's sixth straight win. Fairbairn enters the Texans' bye week having made 19 of 22 field-goal attempts, while his 8.8 PPG is tied for sixth among kickers. Fairbairn converted all six extra-point attempts but did not get a field-goal attempt in Thursday's win over the Dolphins. Analysis: For the first time in 2018, Fairbairn was not asked to attempt a field goal. He has been a steady producer from the kicker spot all season, largely thanks to Houston's inability to finish in the red zone -- however, that was not an issue Thursday. The Texans scored touchdowns on all four trips to the red area, then scored two more beyond the 20-yard-line. Fairbairn entered the game having attempted a league-high 20 field goals. Fairbairn converted both of his field-goal attempts and both extra-point kicks in Sunday's 20-7 win over the Jaguars. Analysis: Fairbairn continues a successful campaign in which he's averaging 9.3 points per game. His 20 field-goal attempts through seven games are tied for tops in the league and are just five fewer than he had in 16 games last season. Fairbairn converted two field-goal attempts and two extra-points for eight points in Sunday's 20-13 win over Buffalo. Analysis: Outside of Week 2 -- when Fairbairn was held to five points -- he's been one of the most prolific kickers in the league. Fairbairn leads the NFL in field-goal attempts (18, 3.0 per game) and has parlayed that into 57 points (9.5 PPG), third among placekickers. The Texans were 1-for-4 in the red zone Sunday, continuing a recurring problem for the team (34.6 TD percentage) that's nevertheless advantageous for a kicker's fantasy prospects. 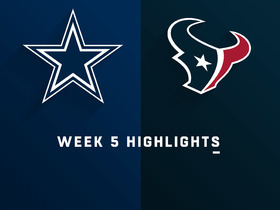 Fairbairn successfully converted four of five field-goal attempts, including the game-winning kick in overtime, in Sunday's 19-16 win over Dallas. Analysis: Fairbairn's leg rescued the Texans for a second consecutive week in overtime, and he may have saved Houston's season after it started 0-3. He's scored 13 points each of the last two weeks and shares the league lead with 16 field-goal attempts. Fairbairn has benefited from the Texans' inability to finish in the red zone -- Houston ranks 31st in red-zone scoring at 36.4 percent. Fairbairn converted 3-of-4 field-goal attempts and all four extra-point kicks for 13 points in a 37-34 Week 4 overtime against Indianapolis. Analysis: On a day when the Colts' Adam Vinatieri set a new NFL career record by making his 566th field goal, the Texans' Ka'imi Fairbairn was the bigger headliner. 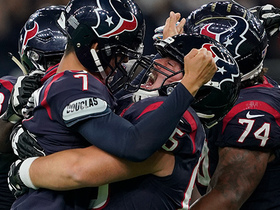 He booted two field goals in overtime to clinch Houston's first win of the season. This was the second straight week with double-digit points for Fairbairn, who has 11 field-goal attempts through four games, tied for most in the NFL. Fairbairn converted all three of his field-goal attempts and his lone extra-point kick in the Week 3 loss to the Giants. 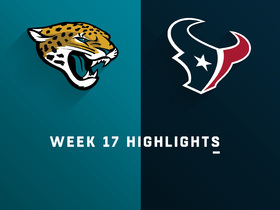 Analysis: Houston's offense was unable to finish in the red zone Sunday, scoring just twice in five trips inside the 20, which enabled Fairbairn's highest scoring output of the season. His 54-yarder was a season long and gives him four makes in six attempts beyond the 50-yard line for his career. Fairbairn converted both extra-point kicks and was one for two in field-goal attempts in Sunday's 20-17 loss to the Titans in Week 2. Analysis: Fairbairn connected from 34 yards and was short on a 54-yarder. He's got the leg to make it from that distance, as evidenced by his being three for four from beyond 50 yards in 2017. Fairbairn converted both field-goal attempts in Sunday's loss to the Patriots. He also converted both extra-point attempts. Analysis: Fairbairn made both field-goal attempts, a 42-yarder and a 36-yarder, despite being sidelined much of the preseason with a right leg injury. The second-year kicker will attempt to continue his perfect streak against the Titans on Sunday. Fairbairn was a full participant at Wednesday's practice and will play this weekend against New England, Aaron Wilson of the Houston Chronicle reports. Analysis: Fairbairn was sidelined during much of preseason with a right leg injury. We're bullish on Fairbairn this year if quarterback Deshaun Watson stays healthy. The second-year kicker averaged 8.7 points per game in the six games Watson started last year and just four points in the other 10 games. Fairbairn (undisclosed) has returned to practice, Sarah Barshop of ESPN.com reports. Analysis: The Texans signed Nick Rose to fill in for Fairbairn, but he missed both of his field goals attempts in Saturday's preseason game against the Rams. Assuming no further setbacks, Fairbairn is locked in as the team's kicker after making 20 of 25 tries in 16 games last year, en route to recording 92 points. Fairbairn (undisclosed) continues to be sidelined due to a soft-tissue injury, the Houston Chronicle reports. Analysis: Fairbairn missed Saturday's preseason game against the 49ers with the injury, and coach Bill O'Brien was unable to offer a timetable for his return. Nick Rose is filling in for the Texans and made his lone field-goal attempt from 32 yards Saturday, although he did miss an extra-point try. Fairbairn could miss the Texans' upcoming preseason contest with an undisclosed injury but should be fine moving forward, Aaron Wilson of the Houston Chronicle reports. Analysis: By all accounts, it doesn't look like Fairbairn will miss much time, if any. The Texans kicker is dealing with an undisclosed injury that is not expected to linger for much longer. Barring any unforeseen setbacks, Fairbairn is on course to be the team's starting kicker for the regular season opener. Fairbairn practiced kicking in wet conditions Friday following a heavy downpour that drenched the practice field at Houston's training facility in White Sulpher Springs (W. Va.), Aaron Wilson of the Houston Chronicle reports. Fairbairn has a firm grasp on the starting kicker job, but new special teams coordinator Brad Seely will continue to evaluate Fairbairn's talent throughout training camp, USA Today's Mark Lane reports. Analysis: Fairbairn attempted just 25 field goals in 2017 during his first year in the league, converting 20 to go along with 32 extra points. He currently has no competition on the Texans roster, but Seely will continue to hold him to a high standard. Fairbairn could become a decent fantasy option if quarterback Deshaun Watson is able to spark the Houston offense in his return from a torn ACL. Fairbairn made both of his field-goal attempts and lone extra-point kick in Sundays' 22-13 loss to Indianapolis. Analysis: Fairbairn booted field goals from 52 and 46 yards and finished the season with 92 points. 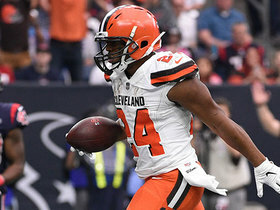 When Deshaun Watson (knee) was healthy, Fairbairn became a productive scorer, but his output suffered after the quarterback's season-ending injury. He's got a long leg, making 9-of-11 from beyond 40 yards, including 3-of-4 from outside 50, and should improve in 2018 if Watson comes back healthy and is as productive as he was in 2017. Fairbairn did not have a scoring attempt in Monday's 34-6 loss to the Steelers. Analysis: Fairbairn was not called on for a scoring opportunity, as the Texans attempted a two-point conversion on their lone touchdown. He has just one point over the last two games and is suffering behind an unproductive offense. There's promise in Week 17 against Indianapolis' 31st-ranked scoring defense, but the offense is a mess and can't be trusted to present Fairbairn with many scoring chances. Fairbairn did not have a field-goal attempt and made his lone extra-point try in Sunday's 45-7 loss to Jacksonville. Fairbairn missed an extra-point kick and a field-goal attempt in Sunday's 26-16 loss to the 49ers. Texans head coach Bill O'Brien suggested Monday that the team would stick with Fairbairn as its kicker, Aaron Wilson of the Houston Chronicle reports. "He's a good kicker. I have a lot of faith in him," O'Brien said of Fairbairn. "He had a bad day [in Sunday's 24-13 loss to the Titans]. He'll be alright." Fairbairn converted two of his four field-goal attempts and his lone extra-point try in Sunday's 24-13 loss to the Titans. Fairbairn connected on all three field-goal attempts and his lone extra-point kick in Monday's 23-16 loss to the Ravens. 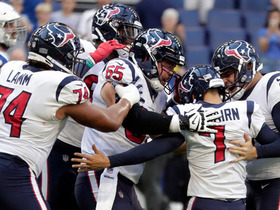 Analysis: In an ideal world, the Texans would have finished off those drives -- they scored one touchdown in four trips to the red zone -- but those failed drives enabled Fairbairn to post 10 points, a seven-week high. There's been some growing pains on offense since Tom Savage took over for Deshaun Watson (knee), but he's moved the team better the last two games, which has led to more scoring opportunities for Fairbairn. Fairbairn booted a 34-yard field goal and was successful on all four of his extra-point kicks in Sunday's 31-21 win over the Cardinals. Analysis: Fairbairn had shanked field-goal attempts in each of the last two games, but he successfully converted all of his kicks in Sunday's win. More importantly for Fairbairn, who had just three points over the previous two games, Houston's offense was the best it's been under Tom Savage. If that keeps up, the second-year placekicker out of UCLA can be a viable kicker. Fairbairn missed a 34-yard field-goal attempt and made his lone extra-point kick in Sunday's 33-7 loss to the Rams. Fairbairn was unsuccessful on a 38-yard field goal attempt and made both of his extra-point kicks in Sunday's 20-14 loss to the Colts. The Denver Broncos' attempt to ice Houston Texans kicker Ka'imi Fairbairn before halftime doesn't work out well. 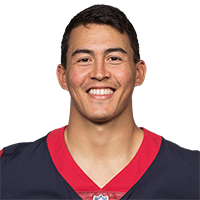 Houston Texans kicker Ka'imi Fairbairn ties the game in closing seconds with 27-yard field goal. 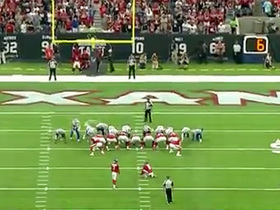 Houston Texans kicker Ka'imi Fairbairn splits the uprights for a game-winning OT field goal. 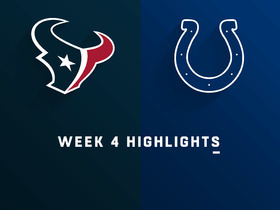 Watch how quarterback Deshaun Watson and the Houston Texans skim by with a win in the final seconds against the Indianapolis Colts.